At Stein Chiropractic Center, Our mission is to improve quality of life through providing chiropractic care to patients in La Jolla, University City and beyond. Some patients are simply interested in getting out of pain and nothing more. Others are focused on maintaining the current state of their health in order to avoid pain. 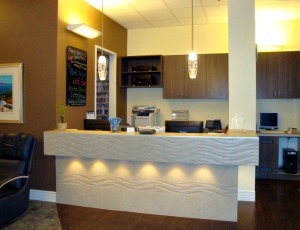 We have clients opt to work on a program of enhanced wellness in order to optimize the state of their nervous system. Whatever your preference, the choice is always yours! One of the practical highlights of our practice is that you don’t have to worry and fuss over having an appointment: just walk in whenever it’s convenient for you. Even if you’re a brand-new patient, most of the time you’ll be able to have an adjustment on your very first visit. We also feature an open adjusting area that makes waiting time greatly reduced. Our patients appreciate being able to get in and get out while still receiving the benefit of Dr. Richard Stein‘s decades of successful adjusting experience as well as deep tissue laser therapy. Patients travel from all over the world to La Jolla to be treated by Dr. Stein, who opened his clinic in 1991. His patients include newborns, children, pregnant women, musicians, actors, athletes, medical doctors, acupuncturists, surfers, seniors and martial artists! Whatever your problem, whatever your age, whatever your condition, contact our office today to see if our University City chiropractor can help!